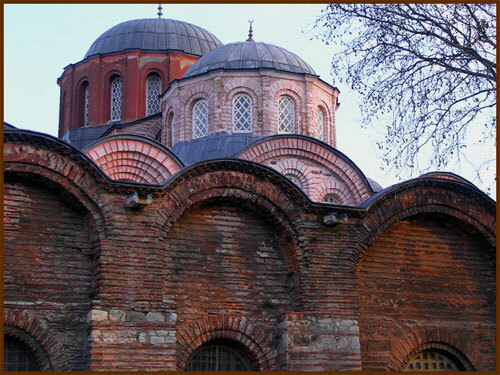 The Zeyrek Church Mosque, formerly the Church of the Monastery of Pantocractor, was built by Byzantine Emperor John II Comnenus (1118-1143) and his wife, Empress Irene. Built on the forth hill of the city overlooking the Golden Horn, the famous Middle Byzantine foundation had a triple-church, a hostel, a hospital, a hospice for the elderly, a medical school and a library. Copies of the Typikon, or the monastery calendar describing services and ceremonies, provide details of the monastery's social and religious functions. The imperial founders endowed the monastery with numerous properties, including other monasteries in the Marmara region, Thrace, Macedonia, Western Anatolia and the Aegean Islands. Only the church, used as a mosque since the Ottoman conquest, and the cisterns of the monastery have remained. The church consists of three joint churches built successively in the 12th century. The church to the south was built first and dedicated to Christ the Pantocrator, or "He who reigns over all, the Almighty"; hence the name of the monastery. A smaller church, built ten meters north of the earlier structure was consecrated to Panagia Eleousa or Merciful Mary. The two churches were subsequently united with a funerary chapel fitted in between, honoring St. Michael the Archangel. Converted to a mosque after temporary use as a madrasa after the Ottoman takeover, the church was named "Zeyrek" after Molla Zeyrek Mehmed Efendi, a resident of the neighborhood who taught at the madrasa. The mosque, repaired after a fire in mid 18th century, fell into disrepair by the 1950s. The library of the monastery burnt in 1934. Archaeological studies by the Byzantine Institute of America in the mid 1950s have revealed floor mosaics of the period. The central church was re-opened for Islamic prayer during this time and the Directorate of Religious Endowments restored the northern church in 1966. The current restoration work, begun in 1997 by Professors Robert Ousterhout, Zeynep Ahunbay and Metin Ahunbay, is funded by the Kress Foundation/World Monuments Fund, University of Illinois Research Fund, Istanbul Technical University and Dumbarton Oaks Project Grants. The Zeyrek Church Mosque was included in the annual list of the World Monuments Watch "100 Most Endangered Sites" in 2002. The triple-church is entered from the west, through the outer narthex of the southern church, which opens into an inner narthex that spans the entire length of the church and gives access into the three naves. The outer narthex, composed of five cross-vaulted bays, has ablution spigots at its north end. Five brick archways, with a rose marble frame set inside each arch, lead into the inner narthex. The central archway between the narthexes is distinguished with its taller frame crowned by a triple arch, across from the entry into the southern church, embellished similarly with marble frames. The inner narthex also has an upper level. Unlike the dim atmosphere of the lower level, the upper level is brightly lit with clerestory windows and windows pierced into the central bay's dome. The southern church, oldest among the three, has a cross-dome plan. It consists of a domed nave at the center, flanked by vaulted aisles on three sides, and a deep apsidal sanctuary to the east. The aisles and sanctuary, in other words, form the four arms of the Greek cross in plan. The aisles here are separated from the nave with four columns symmetrically placed around the nave, which support the weight of the roof along with piers embedded in side walls. The side aisles terminate in narrow miniature chapels with apses, linked with the central sanctuary. The space is lit with sixteen windows on the dome, windows inside the four barrel-vaults, and sanctuary windows placed at two levels. The southern church also has windows to the upper level of the inner narthex, which projects into the space with an ornate bay window. The capitals of the four central columns, the bay window, the mihrab and painted decoration of the interior date from renovations performed at the height of Ottoman baroque. The fine mosaic floor of the southern church, discovered underneath its wooden floor by the Byzantine Institute, provides clues to the original decoration of the interior. Archaeological studies by the Institute have recovered fragments of colored glass, believed to belong to original windows. The marble revetments of the sanctuary have remained intact, while marble parts of the iconostas were used in the minbar. A wall, placed midway between the southern and northern churches, partitions the inner narthex into two sections. The funerary chapel joining the two churches is entered from either section, as well as from the individual churches, although the connecting archways are boarded up. Narrow and deep, the funeral chapel consists of a nave, covered by two oval domes, and a semi-domed apsidal sanctuary. It is dimly lit with windows on its two domes. The crypt underneath the chapel was used for years as the burial ground of the Palaeologan family, including the imperial founders Comnenus I and Irene. Also used as a mosque, the chapel has a mihrab, a minbar and a preacher's lodge today. The church to the north, dedicated to the Virgin Mary, is smaller than but identical to the southern church. It also lacks an exterior narthex, but has a separate side entrance in addition to two doors on the inner narthex and archways that link it to the funerary chapel to its south. The northern church and its narthex were restored by the Ministry of Religious Endowments in 1966-67. On the exterior, the ensemble is animated by the undulating cornice line, which follows the profile of the barrel vaults. Beside the outer narthex, capped at a lower level with a sloping roof, the three churches have a continuous roof cover from which the five domes rise to varying heights reflective of their size and importance. A minaret, added during the conversion, is located at the northwest corner of the exterior narthex, to the right of the main entrance. The stone foundations remain to the south, where a building as large as the northern church was attached to the narthexes. A wooden takiyya (tekke), built on these foundations during Ottoman times, is seen in older photographs along with housing that was built along the southern wall of the churches.